More cast additions have been announced for Good Omens, the upcoming adaptation of the comic novel of the same name by Terry Pratchett and Neil Gaiman. 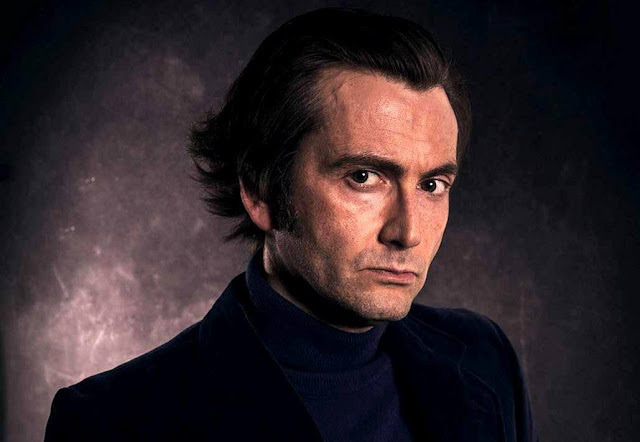 David Tennant and Michael Sheen will star in the series that sees a fast living demon called Crowley and a fussy angel called Aziraphale trying to avert the Apocalypse. The producers have now announced three of the Four Horsemen of the Apocalypse. Joining the cast are Mireille Enos (World War Z, The Killing) as War, Lourdes Faberes (Knightfall, Holby City) as Pollution and Yusuf Gatewood (The Originals, CSI Miami) as Famine. Neil Gaiman, who scripted the series said, "We are hoping that Death will be played by…DEATH." 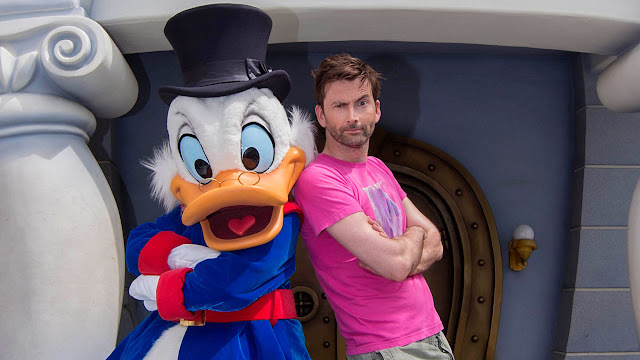 David Tennant stars as Scrooge McDuck in the new series of DuckTales, launching in the UK on Saturday 4th November! The first episode, an hour long special called Woo-oo! premieres on the UK's Disney Channel from 9.30am, repeating at 3pm. If you're looking for Christmas present ideas for young relatives (or maybe a special little extra gift under the tree for yourself), then you might want to check out this new audiobook box set collecting Volumes 1-6 in Cressida Cowell's How To Train Your Dragon series. The collection is released today in the UK, USA and Australia. The adventure saga, which inspired the hit Disney Dreamworks films and TV series, follows the boyhood of Hiccup Horrendous Haddock III, who is destined to become the greatest Viking hero of them all. The designs we've chosen are available at a reduced price until Monday 6 November with T shirts for just $14 / £10.80 each! (Normal RRP $20/ £15.80) That's a whopping 30% off for readers of our site. Mad To Be Normal is to screen at the 2017 New British Film Festival in Russia. The festival takes place across Russia from 30th October until 1st December. Big Finish have released an exclusive 15 minute preview clip of the new Tenth Doctor audio adventure, Cold Vengeance, as part of their latest podcast. 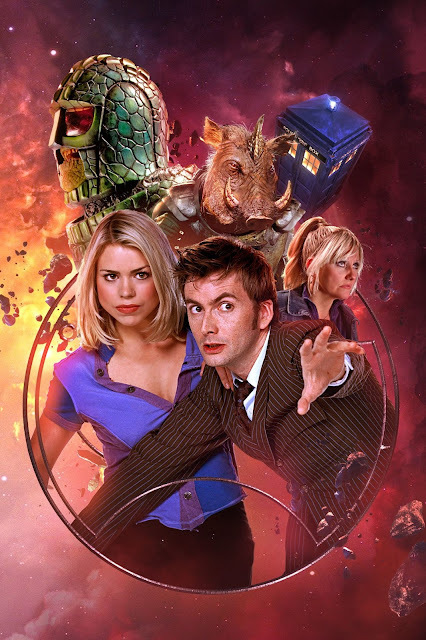 The story is part of a three part set which is released by Big Finish next month and sees David Tennant team up with Billie Piper and Camille Coduri as the Tenth Doctor, Rose and Jackie Tyler. The set opens with Attack of the Zaross by John Dorney, in which an alien invasion of Earth isn’t quite what it appears to be. DuckTales USA & CANADA: New DuckTales On Disney XD Today! Doctor Who NEW! This Week's Doctor Who T-Shirt Collection! 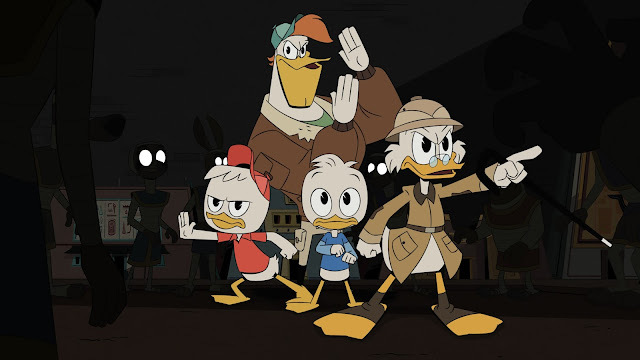 USA & CANADA: New DuckTales On Disney XD Today! The McDuck family are flying back into action this morning with a brand new episode of DuckTales airing on Disney XD in the USA and Canada. Today's new episode is The Living Mummies Of Toth-ra! In a lost pyramid, Louie interprets a pharaoh’s prophecy to his advantage, forcing Scrooge and Launchpad to convince a group of living mummies to rescue him. 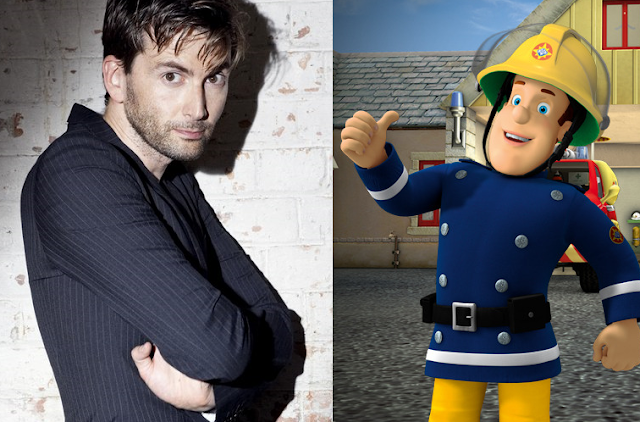 David Tennant plays an alien hunting TV host in the 2016 animated feature Fireman Sam: Alien Alert, which premieres on TV in the UK this morning. The one hour special airs on Channel 5 at 7.25am, with repeat showings the following Saturday on Cartoonito. .
Fireman Sam: Alien Alert features the voices of Steve Kynman as Fireman Sam and Norman Price, Tegwen Tucker as Penny Morris and Su Douglas as Dylis Price. David Tennant guest stars as TV presenter Buck Douglas. The feature was written by Laura Beaumont and Paul Larson, directed by Gary Andrews and was produced by HIT Entertainment. Nominations for the 18th annual WhatsOnStage Awards are now open and you can nominate David Tennant for his performance as DJ in Don Juan In Soho for Best Actor In A Play and Don Juan In Soho as Best Play Revival. The shortlist of nominees will be announced on Friday 1 December 2017, after which you will be able to vote for your favourites to win. Winners will be announced at the ceremony on 25th February 2018 at the Prince Of Wales Theatre in London. The awards are the only major theatre awards where the audience are the judges across all categories. The awards strictly only allow ONE VOTE per person so use your vote wisely. 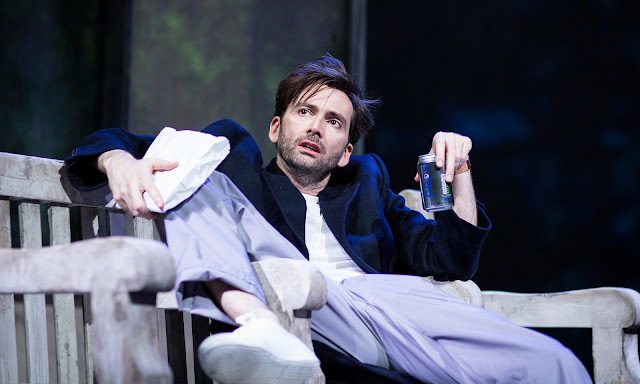 David Tennant starred as DJ in a revival of Patrick Marber's play Don Juan In Soho at London's Wyndham's Theatre from 17th March 207 - 10th June 2017. 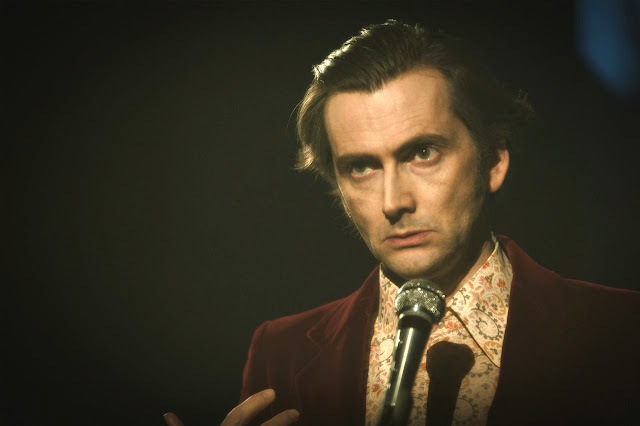 Mad To Be Normal, the UK movie based on the life of the revolutionary Scottish psychologist RD Laing, will screen in Naples, Florida today as part of the Naples International Film Festival. The film, starring David Tennant and Emmy-award winner Elisabeth Moss, will screen at the Silverspot Cinema Screen 11 at 12.45pm. A second screening will take place tomorrow at the same venue at 6.00pm. 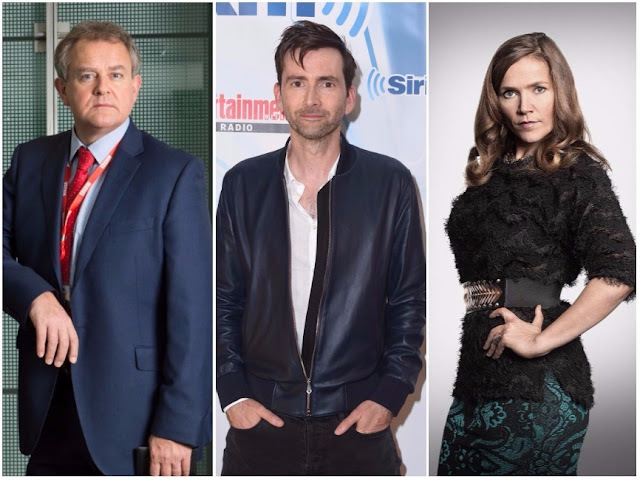 Today is your last chance to vote for David Tennant to receive a National Television Award as the longlist voting is closing at 11:00pm (BST) today. 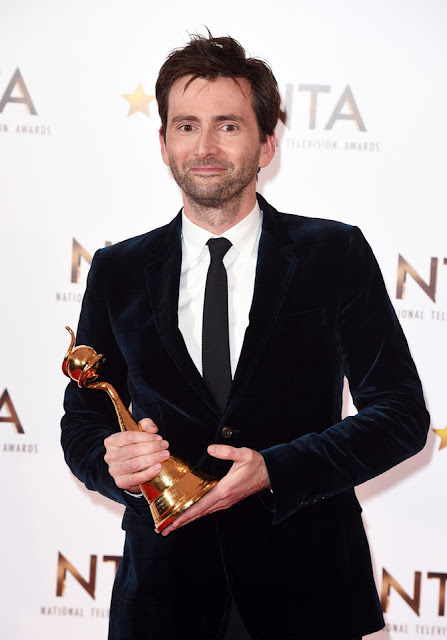 David Tennant is one of the contenders in the Best Drama Performance category, nominated for his role as Alec Hardy in the third and final series of Broadchurch. The category has some strong competition with Suranne Jones for Doctor Foster, Emily Watson for Apple Tree Yard, Joanne Froggatt for Liar and Aidan Turner for Poldark also amongst the 60 candidates vying for the title. Also, three of David's projects have made the longlists. Broadchurch, written by Chris Chibnall is up for Best Crime Drama and will compete against a group which includes Line Of Duty, The Missing and Little Boy Blue. 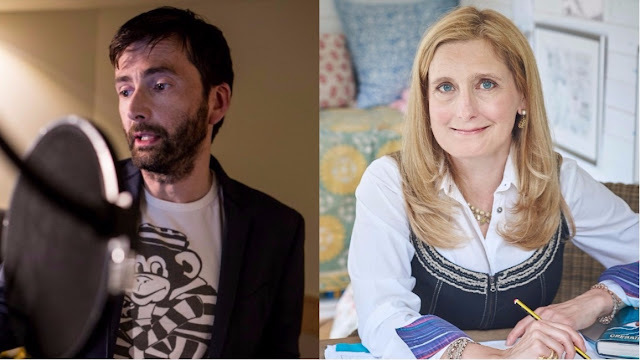 David Tennant will narrate a newly commissioned documentary, Trust Me - I'm A Robot, airing as part of Channel 4's season dedicated to the revolutionary advances in robots and artificial intelligence, Rise Of The Robots. As walking, talking robots look set to join us in our workplaces, in our homes … and maybe even our bedrooms…the season explores what this future will look like, and how can we make the most of it. The third season of the award-winning BBC comedy W1A has been added to Netflix in the USA today. The last ever season of the show, which completed its TV run in the UK only yesterday, sees Hugh Bonneville back in the role of BBC Head Of Values Ian Fletcher. Jessica Hynes also returns as PR guru Siobhan Sharpe, alongside other cast members Jason Watkins, Monica Dolan, Sarah Parish, Nina Sosanya, Sara Pascoe, Hugh Skinner and Rufus Jones. 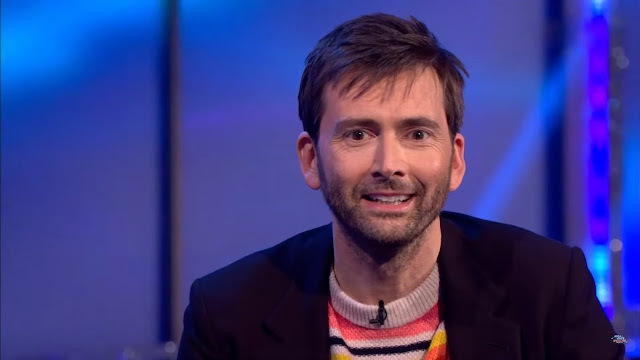 David Tennant provides a tongue-in-cheek voiceover to the spoof fly-on-the-wall footage. Season 3 sees a series of ever more inept committees and executives trying to justify their own roles as the venerable corporation moves into an uncertain era. 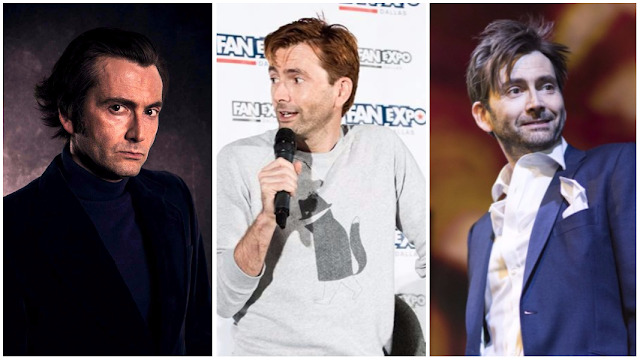 David Tennant visited Texas over the weekend as a guest at the Dallas Fan Days fan convention. 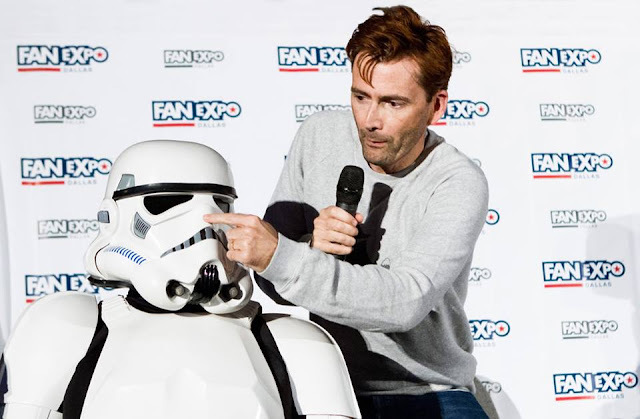 As well as signing autographs and posing for photos with fans, David took part in a Q&A panel on Sunday in front of a packed out Main Ballroom where he discussed, among other topics, his new role in Good Omens, the ASL signs for Walmart and Target and which fictional character could be Time Lords. The latest cast member joining Good Omens has been revealed: Josie Lawrence will be taking on the role of Agnes Nutter, the 17th Century witch and author of the only entirely acurate book of prophecies ever written. The six-part television adaptation by BBC Studios of the best-selling novel by Neil Gaiman and Terry Pratchett is currently in production and will be launched by Amazon Prime Video in 2019, and shown at a later date on BBC Two. 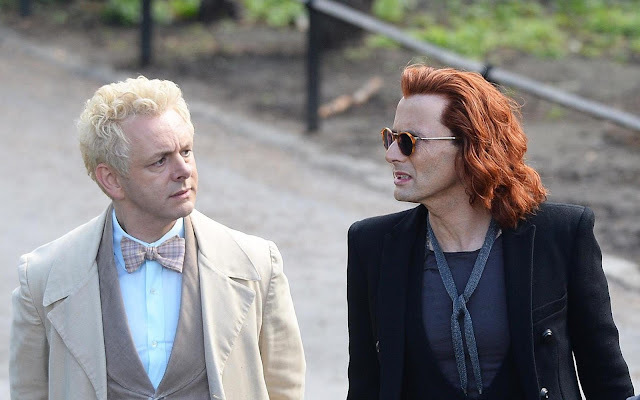 David Tennant and Michael Sheen star as fast-living demon Crowley and fussy angel Aziraphale respectively. 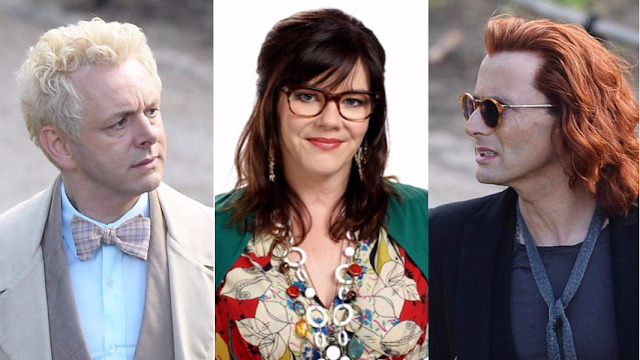 Neil Gaiman, who has written the screenplays for the series, made the announcement today via Twitter, saying: "I'm thrilled and utterly delighted to announce that Agnes Nutter in the Good Omens TV series will be played by Josie Lawrence." The third and final season of Broadchurch will be added to Netflix in the USA next month following its TV premiere on BBC America earlier this year. All eight episodes will be able to stream from November 27th. 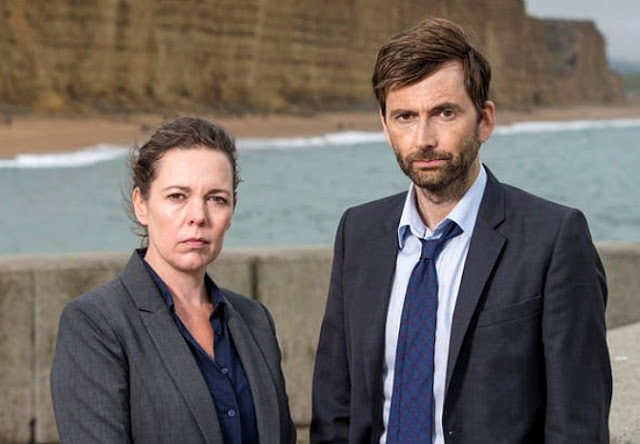 The third and final chapter of the UK’s acclaimed crime drama sees the detective duo Detective Sergeant Ellie Miller (Olivia Colman) and Detective Inspector Alec Hardy (David Tennant) investigate a serious sexual assault that shocks the tight-knitted seaside town to its core. Jodie Whittaker and Andrew Buchan return to play Beth and Mark Latimer. They are joined by National Television Award winner Julie Hesmondhalg, BAFTA winners Lenny Henry and Georgina Campbell along with Sarah Parish, Charlie Higson and Mark Bazeley. 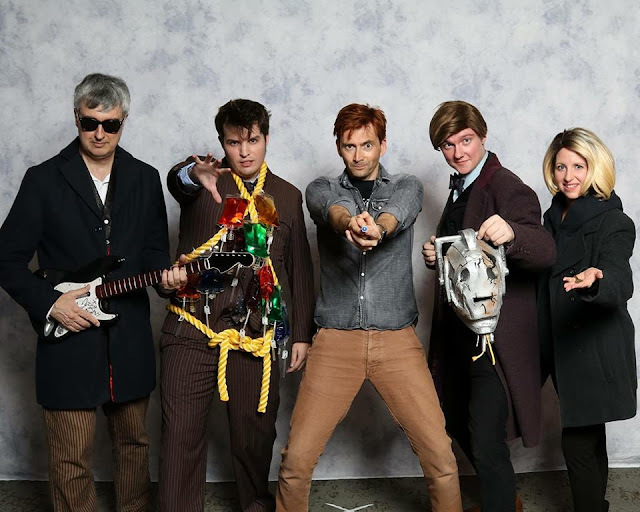 David Tennant appeared at Dallas Fan Days over the weekend and took part in a number of photo ops alongside his fans. Many thanks to all of our readers pictured in this final blog who have kindly shared their wonderful photos and stories with us. Laura Stringfellow "I'm the weeping angel in the photo. David hugged me when I first walked in; but when I leaned in, my wings naturally moved with me, and I accidentally smacked him in the head with the right wing. Sorry, David!" Susan Lilley "I still don’t think it’s sunk in that I actually was, ya know, hugging...omg....I think it just hit me. I was ...holy cow....hugging David Tennant!!! Dressed as a Doctor Hobbit?!?! How is this my life?" Leah Felice Unger "Our group L.I.'ND.A. found him after all our research!!" DuckTales To Get UK Premiere Next Month! New DuckTales On Disney XD Today! DuckTales Comic Book #1 Out Now! NEW! Doctor Who Tee Collection!